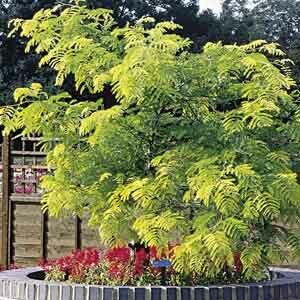 Sunburst' is a thornless variety of Honeylocust with foliage sure to brighten any garden. Leaves emerge yellow then age to bright green and finally shade to yellow again in autumn. The tiny leaves, clustered along the branches, add fine texture to the landscape and make for minimal cleanup after leaf drop. A classic favorite for landscape focal points. Provides shade and large-scale beauty to landscapes. Adapts well to a range of soils with excellent drainage. Drought tolerant once established. Prune when dormant, in late autumn or late winter.